One of nine or so regional types, the Dauphiné pattern is an archaic French pattern which was manufactured in the Lyons region during the 17th century. It lasted in France until the end of the 18th century but was also used in Italy until it was superseded by Piedmont's own version of the Paris pattern. Although this latter design is now double-ended the resemblances to the earlier prototype can easily be seen. Some of the figures in the Dauphiné pattern are common to several other early types, for example the King of Clubs who carries a sword and orb, and the Jack of Clubs (top right) with one hand on his hip. Above: cards from a facsimile print of the Dauphiné pattern, pulled from original woodblocks made by P. Letranger, c.1650. Published by Stuart Kaplan, 1986. Above: cards from a double-ended version of the Dauphiné pattern by an anonymous manufacturer, possibly French or Belgian, printed from woodblocks and coloured by hand using stencils, c.1830s. 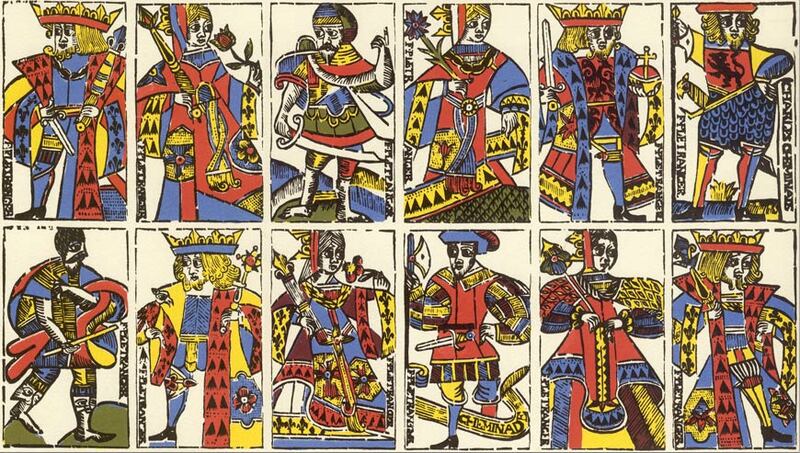 The King of Clubs carries an orb and a sword, exactly as in the full-length version (shown above top row). The King of Diamonds has a falcon on his wrist, the Jack of Clubs, with a lion on his breast, stands facing the front, one hand on hip, the other on top of his halberd. The Jack of Diamonds displays what might be a north Italian influence in his style of dress.